Use Charizard to fly back to Malie City. Heal up, then head left from the Pokemon Center back to Malie Garden. 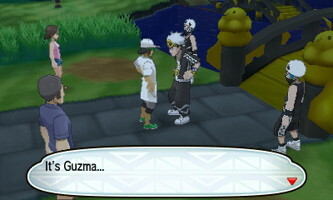 You'll walk in on Professor Kukui being harassed by a few Skull Grunts and Admin Guzma. He has a Lv. 30 Ariados and a Lv. 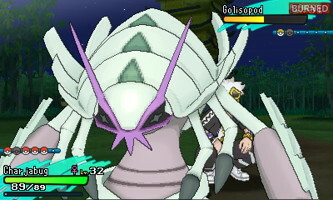 31 Golisopod. After winning, Kukui will give you a Z-Crystal for your starter's final evolution and take back his mask. Lillie and Acerola will also meet up and challenge you to her trial. Head left and south to arrive at Route 11. You can speak to the woman in blue here to heal your team at any time while on this route. 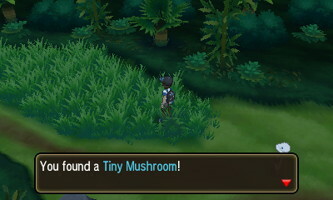 Grab a Big Mushroom from the tall grass to your left. There's a couple trainers that will double battle with you a little further down the route and TM74 - Gyro Ball can be found on the middle path. Keep moving right, there will be another trainer and a Tiny Mushroom at the end of the fork. You'll come accross another trainer doing crunches to the right and a Quick Ball near him. There's another Big Mushroom in the tall grass just south of this. You can also find a Zygarde Cell here during the nighttime. When you arrive at the gate, the lady there will open it for you (assuming you passed the last trial). 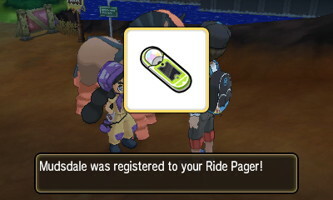 Head right a little on this trail and Hapu will stop you to register Mudsdale to your Ride Pager. Use it to cross the rocky path and pick up the Burn Heal and Zygarde Cell on the other side. Hop off Mudsdale when you get to a narrow stretch to the left that it can't fit through. You'll run into a trainer in a little meadow and an Elixir off a smaller pathway. 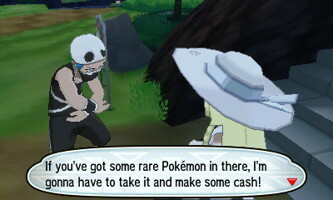 You can go back and face another set of trainers in a double battle and pick up a Zygarde Cell. After the double battle, there's another trainer and a Hyper Potion near him. 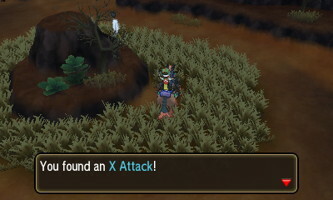 Head right a little from the sign on the route to get an X Attack and battle another trainer. 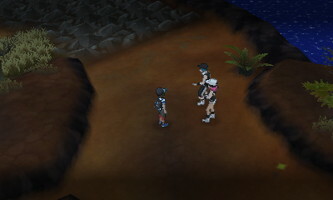 From here you can head straight onto Route 13 or head south to the Secluded Shore to face a few more trainers. You can also pick up a Zygarde Cell on the north end of the beach and a number of pearls and big pearls by sniffing with Stoutland. Head left to Route 13 when you're ready. 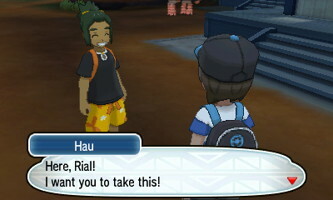 You'll be stopped by Hau as soon as you're on Route 13 and he'll give you a Max Potion. Gladion will then show up asking about Cosmog. When the cutscene is over, grab the Zygarde Cell left of the motel. 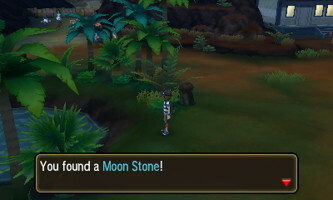 Walk left towards the oasis and pick up a Moon Stone. You can also pick up a Zygarde Cell next to a trailer to the south. South of town near the waterfront you can pick up a Guard Spec.. Head inside the trailer closest to the desert and talk to the punk and tell him you want to fight him. He'll chicken out and instead give you TM12 - Taunt. Head left to Tapu Village. 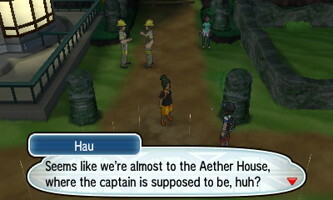 Head to the center of the village to meet up with Hau again. After healing up at the Pokemon Center, pick up the Zygarde Cell to the south along the fence. Now, exit Tapu Village to the left. Continue north on Route 15 and enter the Aether House. Upon entering you'll immediately be challenged to a battle from a pre-schooler with an Elekid. Acerola will then show up and suggest once again that you attempt her trial. Exit the Aether House afterward. Once outside, you'll have to stop Lillie from an attack by a Team Skull Thug. You should be able to make quick work of his Drowzee. Lillie will thank you with 5 Luxury Balls. Head back to Tapu Village to the right. Acerola will meet you and lead you down Route 14. Continue on this route past a fisherman. You can pick up a Zygarde Cell near the rocks here. You can head north onto the pavement and pick up the Max Potion here. There will be another trainer to defeat in front of the slope; you can pick up a Zygarde Cell on the right side of the beach next to the cliff. You can also surf left of this area to a small platform. 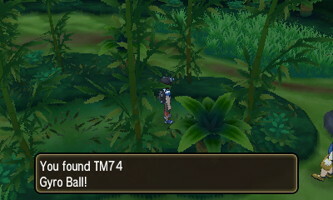 Here you'll find TM30 - Shadow Ball. Once you're ready, head through the gate to the north and talk to Acerola. 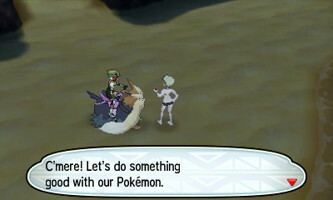 Acerola will explain that you'll use your Poké Finder for this trial. Enter the building whenever you're ready and the trial will begin. 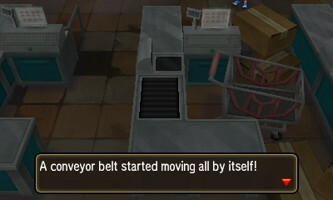 A conveyer belt will begin to move. Investigate and snap a picture of Gastly. Each time you snap a picture of a Pokémon, you'll need to defeat it in battle. A shopping cart will start to rattle when you move left. Investigate it and take a picture of the Haunter. Follow the Pikachu again and you'll notice some levitating dolls. Investigate and snap a picture of the Gengar. Head north towards the doors and enter the back room. 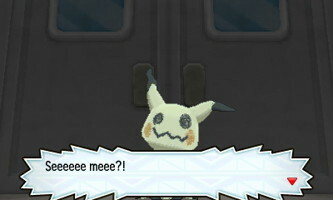 Snap a picture of the Totem Mimikyu that can be found behind you. After you've snapped the picture, you'll begin a battle with the Totem Pokemon: a Lv. 33 Mimikyu. It'll summon Lv. 27 Haunter as it's ally. This Totem Pokemon is very challenging and it has powerful moves that are likely able to OHKO many of your Pokemon. Keep in mind that the first time you hit Mimikyu, you won't deal damage due to it's ability, so don't use a Z-Move right away. You'll also likely be put to sleep and paralyzed. Steel type work best against Ghost/Fairy, but Ghost moves are super effective as well (keep in mind this also works the other way). 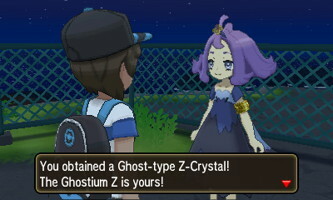 Once you beat the Totem Mimikyu, Acerola will award you with Ghostium Z and 10 Dusk Balls. Your trial will be complete.